How do you “Right-Size” Your Plate? We all know that proper portion sizes are important. The struggle is having the time to focus on each plate that we fill, making sure that it contains the perfect amount of food from each food group. That’s where we come in! We want to make sure that your plate is full of all the nutrients that you need, and is void of the empty calories that don’t provide your body with any nutritional value. There are many resources available to us today to educate ourselves on proper nutrition and serving sizes. Right here at NCES, we recently launched our “Right-Sized Portion” line of products, including plates and tearpads. These products make it fun and easy to fill your plate with the right foods. The American Dietetic Association also offers many great resources for helping us learn how to live healthier lives. A lot of these great resources are available year-round. Because March is National Nutrition MonthTM, they have many extra resources available at no cost. We love their interactive nutrition games. Last week on Facebook, we mentioned the “Rate Your Plate” game. 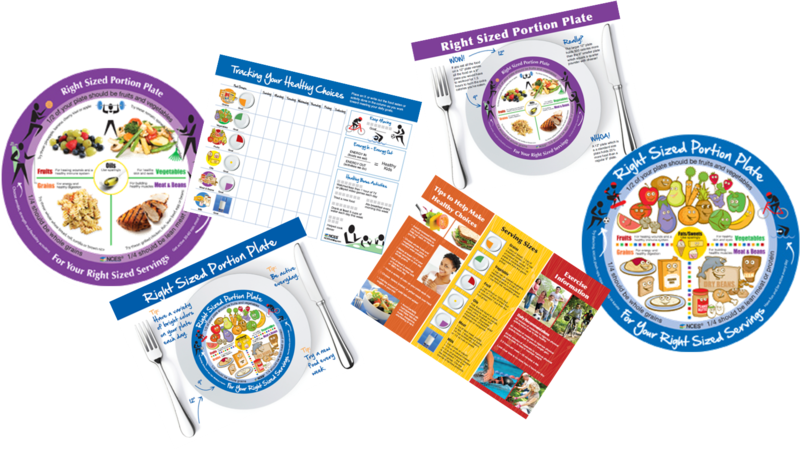 This game provides a fun, interactive way to understand more about how the choices you make when filling your plate affect your overall nutrition. If you haven’t had a chance to play yet, be sure to go check out “Rate Your Plate”, as well as all the other great games, today! Proper nutrition is very important, and should be an important part of your daily life. At NCES, we have an on-staff dietitian who is always here to answer your questions. So, whenever you have questions about living healthy, be sure to visit www.ncescatalog.com and “Chat with our Dietitian”, give us a call or email us at info@ncescatalog.com.